Chronic depression and anxiety can be crippling to those who suffer from the disorders, with many people reporting a much lower overall quality of life compared to those who aren’t affected. Both depression and anxiety make it more difficult to socialize and to perform even simple tasks at home, at work and at school. Plus, both conditions can affect overall health. Multiple studies have linked stress and depression with increases in heart disease, fibromyalgia and even cancer, and being depressed or anxious can also cause disturbances in sleep, another cause of chronic health conditions like cardiovascular disease and obesity. While the underlying causes of depression are largely unknown or poorly understood, one Danish study encompassing 91,637 patients with mood disorders showed that having an autoimmune disorder increased the risk of developing a mood disorder by a surprising 45%, and having celiac disease increased the risk of developing a mood disorder by 91% (see table below). Celiac disease is itself an autoimmune disorder, and people with celiac disease are more likely to have other autoimmune disorders as well. 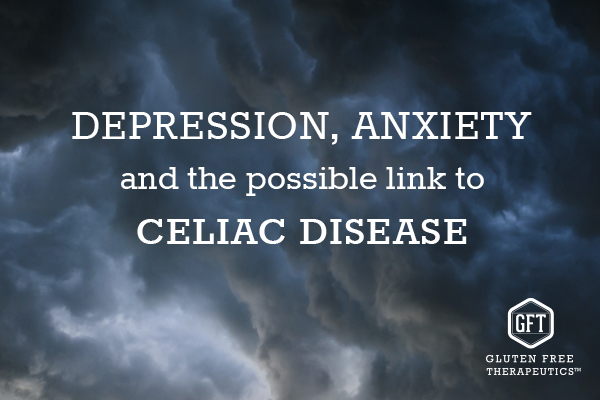 Anxiety and depression are listed as two of the common symptoms of celiac disease. A meta-analysis from Denmark including results from 18 separate studies concluded that like other physical illnesses, depression is common in patients with CD. At least one case study has shown the positive effects of a gluten-free diet on mood disorders in patients with celiac disease; in this study from Poland, a patient suffering from treatment-resistant depression and anxiety showed marked improvement after diagnosis of CD and adherence to a gluten-free diet. 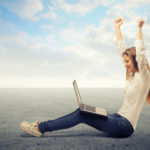 Interestingly, a German study found that women with CD who followed a gluten-free diet were more likely to suffer from anxiety compared to women who did not have celiac disease, and further recommended women with celiac disease be screened for anxiety symptoms, although this study is limited by a small sample size (441 patients). Like most mental health issues, depression and anxiety are often misunderstood by people who have never experienced the disorders. Often, people with these chronic problems are told to “cheer up,” or worse, made to feel they’re not being grateful for the good things in their lives. What these well-meaning people don’t understand is that chronic depression and anxiety disorders are just as “real” as other types of diseases, and just as a diabetic can’t “control” his or her blood sugar by thoughts alone, a person suffering from depression or anxiety can’t simply turn the tides of their illness by positive thinking. What it comes down to is this: If you’re suffering from depression or anxiety, the first step toward feeling better is to find a caring, skilled healthcare provider who understands mental health issues, their symptoms, the effects they can have on life, and the ways they can be treated. 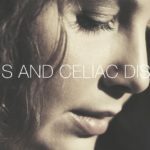 If you also suffer from gluten sensitivity or celiac disease, making your doctor aware of the medical literature exploring the link between celiac disease and depression and anxiety can be helpful, since many of these studies are not widely distributed. And if you’re already following a gluten-free diet, make sure all the products you’re using from pharmaceuticals to bath and beauty products are completely gluten-free. 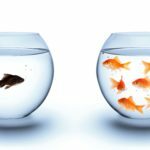 Celiac Isolation… Is It Inevitable? Hello Ken. PLEASE PLEASE look into the Paleo Approach autoimmune protocol -Sarah Ballantyne – paleo mom.com her approach saved my life! All the best! I became CD symptomatic in my teens, just around the time I began having issues with anxiety and depression. All my life, I thought feeling sick all the time was normal. I was just diagnosed with CD two years ago. Although, I was diagnosed with anxiety and depression 15 years ago. I also have classic Barrett’s Syndrome. I went through the exact same thing! I was diagnosed with depression and anxiety in my teens following a traumatic incident (friend died in car crash) but there were signs all along that I had problems. Just 2 or 3 years ago, I found, through reading and studying the symptoms, that I probably have Celiac disease. I’ve never been diagnosed because I don’t have health insurance and cannot afford the test yet, but being gluten-free has helped TREMENDOUSLY! I started to have CD symptoms in 6th grade. I went undiagnosed till some time between 9-10th grade. Not for lack of trying on my mothers part. She took me to several doctors but was told that I was just eating too many cookies. In disgust she stopped trying to find answers as she could not make the doctors understand that something was wrong. I suffered from depression. my depression got worse after I went G-free. In 12th grade my new doctor put me on a heavy vitamin D prescription (100,000 units three times a week). I am still on a constant supply of Vitamin D and now Vitamin C. THe C helps to lessen the CD symptoms. Something that I have discovered was that I burn through my vitamins quicker than I should. this often leads to different problems including fragile skin, bruises and a retune of my depression. Thank you for this. I used to suffer from depression and debilitating anxiety. I still have a little anxiety (especially when I’m eating food someone else prepared) but I am pretty much OK. This article explained a lot. Praise God I’m GF and living better than ever before. I completely understand your anxiety about eating food someone else prepared. I am so sensitive to gluten now that if I can’t find out whether or not the dish is gluten-free, I don’t eat it. It’s not for lack of politeness – it’s protecting myself from a nasty rash and digestive issues (including nausea/vomiting). My family still sometimes get irritated with me because it is sometimes inconvenient. However, a little inconvenience is worth the trouble. I’m glad you improved on a GF diet just like me.